This photo makes my heart beat fast. It’s from Betsy McNair’s recent My Mexico Tours e-newsletter. I met Betsy a decade or so ago when I was writing for Fodor’s and she was managing one of my favorite inns, La Casa de Espíritus Alegres in Guanajuato. Now in addition to leading wonderful culinary and cultural tours, she is the author of Mexicocina: The Spirit and Style of the Mexican Kitchen. Gina: What’s the name of that fruit? Betsy: Pitaya (sometimes spelled pitayha) — fruit of a night-blooming cactus native to Central and South American, where it was called fruta escamosa, scaly fruit. 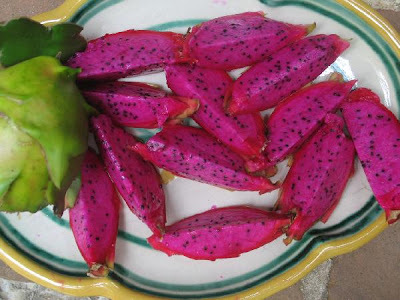 It is now cultivated in Vietnam, Thailand, etc., where it’s called dragon fruit. There are a few different types of the fruit, the most common one seems to be red-skinned, white on the inside, with black seeds. This one grows wild in Diana Kennedy’s garden in Zitacuaro, Michoacán.You’ll recognize the plant, I think, as there are many varieties (both fruiting and non-fruiting, but all with a great big flower) in gardens all all over Mexico. Long jagged-edged succulent-type leaves often hanging down over a wall. Gina: What does it taste like? Betsy: Wet and smooth, mostly, with crunch from the little seeds. Slightly sweet. Surprisingly bland in flavor given the outerspace color. Gina: How does one eat it? Betsy: DK just sliced it up as you see and we had it for a light refreshing dessert after one of our classes. I think I saw those at the Berkeley Bowl and had no idea what they were. Thanks for the info! I’ll have to try them the next time I run across them.